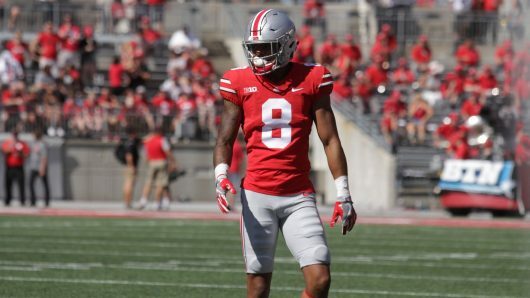 Freshman wide receiver Trevon Grimes will move on from Ohio State before the completion of his first season with the program, according to a report by the Sun-Sentinel. The newspaper reported Friday the former four-star prospect out of St. Thomas Aquinas (Florida) will transfer to Florida. Grimes has been away from Ohio State since October when he left the team to deal with, what head coach Urban Meyer called, family health issues. On November 8, Meyer said he was taking classes in Florida and he expected Grimes would eventually rejoin the team. This season, Grimes had three catches for 20 yards. He caught one pass for eight yards against Army and had two catches for 12 yards against UNLV. Grimes was the 41st-ranked player in the 2017 class and the No. 6 wide receiver, according to the 247Sports composite rankings. An Ohio State spokesman was not able to confirm the report. Grimes was a Wasted Effort….. should have never bothered with the Head Case. Family Issues…..lol…..what a crock!